How do you feel about advancing to the semi-finals? Today's games went better than I expected them to. So I really don't know what I'm feeling right now. Right now I'm not really here. The match just ended so I'm not feeling it yet. But I did want to go to the season finale so I am satisfied that I secured my spot for that. You took down last season's champion. Was there anything that you really focused on as you were preparing? I didn't really pay attention to the fact that RorO was my opponent. I just told myself to do my best regardless. It ended up working out well. It seems like your recent Proleague performances haven't been the best. I think it's because I've been neglecting to prepare. Honestly, I was planning on playing through the basics for my Code S match today. But coach Calm helped me out a lot since yesterday so I was able to prepare more extensively. You mixed up some tanks into your army composition for game 1. On Daybreak, it's really easy for my opponents to use my own widowmines against me. So I decided to throw in some tanks in my army because I figured it would work out well. For game two, you went for an early game attack. Originally, I was planning on using a different strategy. I prepared that strategy just last night during dinnertime. I figured I needed to throw a twist in there at least once. Even if I had lost, I wanted to pressure my opponent. I scouted the 7:00 position cause I thought a hidden expansion could be there and I was right. I was able to think really well through the basics. A really aggressive attack came for game three. What were you thinking when that happened? When I saw those roaches approach my natural I thought I had lost because our build orders got crossed. So I just told myself to defend against the attack to the best of my abilities. But RorO ended up losing a lot of drones and he didn't gain a lot from his attack. So I think I was given another chance. Were you expecting a 3-0 score? I figured things would go really easily as long as I was able to win game one. Likewise, I figured the match would get difficult if I lost game one. You will face either Bomber or Symbol in the semi-finals. Honestly, I think facing Symbol would be the best. I don't really like mirror matches. Seems like this is your chance to grab the championship. How do you feel? I feel good for this season. I can see myself winning the championship if things turn out well for me from here on out. Even if I don't win the championship, I still have the season finale so I won't dwell on it and just see everything as a good opportunity. Who do you think will between Soulkey and sOs? I think Soulkey is going to win but if I do make it to the finals, I would want to face sOs. I just think it'll be more fun to play against him. Calm hyung really worked hard to help me out since yesterday. It seemed to have really helped so I want to thank him for that. You took down Bomber and advanced to the semi-finals. How do you feel? I am so glad that I was able to advance like this. I am even more glad now that I can attend the season finale. How did you prepare for today's match? I've been playing a lot of ZvT lately so I was able to show both all ins and macro games. I really wanted to win today so I prepared nothing but desperation builds. I lost a lot though while preparing for my game one build. I wanted to play mind games with Bomber so I went for roach/ling/bling but he ended up coming out on top for the mind games. Still, I expected a 3-1 score. It seems like game one loss made you really nervous because you did things like clump up your overlords, and awkward scouting. I wasn't really affected. Everything I did was pre-planned out. You used a nydus strategy for game three. It's normally really difficult to continue with nydus play if your first one doesn't work out. It's a strategical thing so I can't really explain it but I was sure that it was going to work. I knew I was going to win if I broke through. Nydus plays also depends on maps at times. But in the end, I'm going to keep it as my secret (laughs). You will face INnoVation in the semi-finals. INnoVation's momentum is really good. He is such a good player. 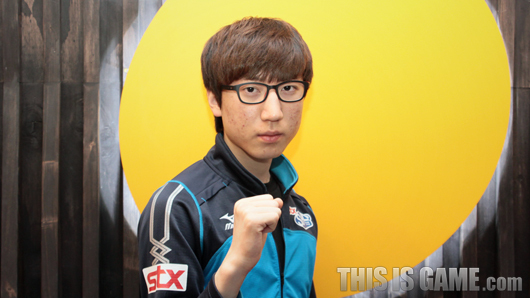 I think he's the best Terran player out of both eSF and KeSPA. I do feel a little nervous about having to face him but I think it's going to be really beneficial for me to face a player like him. INoVation's TvZ is intense. Are you confident? INnoVation's strength comes from his solidness. I'm going to have to prepare harassment builds for him. I need to create openings for me because if I play standard then it's going to be a difficult match. It feels like a lot of Zerg players these days prefer the roach/ling/bling composition. I think it's because of widowmines. I'm sure we could try out different build orders if widowmines didn't exist, but there are too many openings before we can hit Hive tech, so I think that's why we go for roach/ling/bling because of the lack of tanks. Your opponent from today, Bomber, and INnoVation have completely different play styles. Do you think roach/ling/bling will work against INnoVation? Today's strategies were not solely meant for just Bomber. That strategy works against all Terrans. I won't know for sure until we play though. Unfortunately, Last season you finished off with second place. You must want the championship real badly this season. If I do make it to the finals, I would want a Zerg opponent since I'm comfortable with ZvZ. But I think I've also found the answer to ZvPs so I'm not really worried. I've known sOs since the Hwaseung days so meeting him on a grand stage would be a good experience in my opinion. I want to thank my teammates, Reality, BarrackS, Mind, and Center for helping me with practice. The build orders I used today were recommended to me by HyuN hyung and fellow mates. I want to thank them for always helping me out. 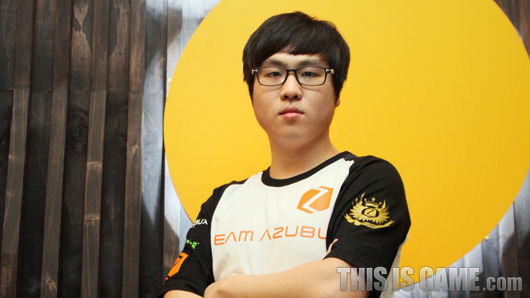 Lastly, I hope a lot of people will tune into AZUBUtv and I want to thank our sponsors Razer and AZUBU. INnoVation must have one Calm coach. I think I'd feel guilty after pulling that one out. Innovation is looking so strong. Looking forward to Symbol's interview. Thanks so much Seeker! Da Mastah!! Calm doing work recently, 2 proleague punchbags advance directly into code S, Bogus performing. They all gave a shout out for Calm. Wooot Symbol an OZ player? Symbol fighting! Nope. I'm fucked. He wrecked RorO. I enjoyed the fake answers. Sheesh guys. Thank you Seeker!